Can better internet help close regional income gaps in Turkey? How important are social media for informal learning among teachers? And how important is immigrant health for domestic policies? These are just a few of the questions tackled by our researchers in September 2016 — in four working papers and seven journal articles, among many others. Click here for the full list. ‘River deep, mountain high: Of long-run knowledge trajectories within and between innovation clusters‘ brings together the topics of geographical clusters and technological trajectories, and shifts the focus of the analysis of regional innovation to main technological trends rather than firms. The authors define a number of inventive clusters in the US space and show that long chains of citations mostly take place between these clusters. This is reminiscent of the idea of global pipelines of knowledge transfer that is found in the geographical literature. The deep citations are used to identify technological trajectories, which are the main directions along which incremental technological progress accumulates into larger changes. While the origin and destination of these trajectories are concentrated in space, the intermediate nodes travel long distances and cover many locations across the globe. The paper concludes by calling for more theoretical and empirical attention to the “deep rivers” that connect the “high mountains” of local knowledge production. By Prof. Bart Verspagen and Dr. Önder Nomaler. ‘Demographic dynamics and long-run development: Insights for the secular stagnation debate’ takes a global, long‐run perspective on the recent debate about secular stagnation, which has so far mainly focused on the short term. The analysis is motivated by observing the interplay between the economic and demographic transition that has occurred in the developed world over the past 150 years. To the extent that high growth rates in the past have partly been the consequence of singular changes during the economic and demographic transition, growth is likely to become more moderate once the transition is completed. At the same time, a similar transition is on its way in most developing countries, with profound consequences for the development prospects in these countries, but also for global comparative development. The evidence presented in this paper suggests that long‐run development dynamics have potentially important implications for the prospects of human and physical capital accumulation, the evolution of productivity and the question of secular stagnation. By Prof. Klaus F. Zimmermann et al. ‘A ‘healthy immigrant effect’ or a ‘sick immigrant effect’? Selection and policies matter’ examines the health of immigrants within the context of selection and migration policies. Using SHARE data the authors examine the HIE comparing Israel and 16 countries in Europe that have fundamentally different migration policies. The study’s results provide evidence that a) immigrants to Israel have compromised health and suffer from many health ailments, making them less healthy than comparable natives. Their health does not improve for up to 20 years of living in Israel, after which they become similar to natives; b) immigrants to Europe have better health than natives and their health advantage persists up to six years from their arrival, after which they are not significantly different than natives except in one case in which the health of immigrants became worse than that of natives after 21 years. These results are important for migration policy and relevant for domestic health policy. By Prof. Amelie Constant et al. ‘Reservation wages of first- and second-generation migrants’ analyses the reservation wages of first- and second-generation migrants, based on rich survey data of the unemployed in Germany. The results confirm the hypothesis that reservation wages increase over migrant generations and over time, suggesting that the mobility benefit of immigration may be limited in time. The paper thus contributes to the broader debate regarding migrants’ flexibility and adaptability. As often suggested, migrants may accelerate the job matching process and may help improving labour market efficiency and functioning. However, the authors also show that this mobility benefit of immigration may be limited in time due to economic assimilation. By Profs. Amelie Constant, Klaus F. Zimmermann et al. ‘Twitter as an informal learning space for teachers!? The role of social capital in Twitter conversations among teachers’ argues that Twitter can contribute to the continuous professional development of teachers by initiating and fostering informal learning. While previous research has largely neglected teachers and the role of social capital on Twitter, this study addresses this shortcoming by analysing a hashtag conversation among German speaking teachers. 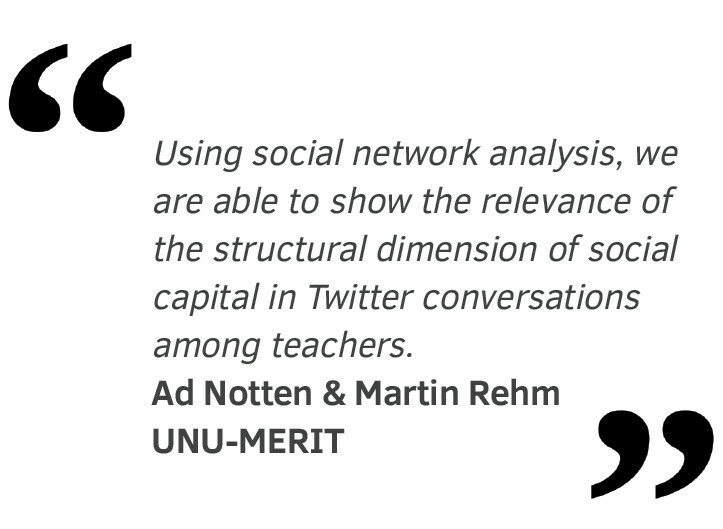 Using social network analysis, the authors are able to show the relevance of the structural dimension of social capital in Twitter conversations among teachers. By Dr. Martin Rehm and PhD fellow Ad Notten. ‘The Power of the Strong State: A Comparative Analysis of the Diaspora Engagement Policies of India and Ethiopia’ focuses on the mechanisms of emigration management and problematises government involvement in diaspora engagement. By exploring two cases of diaspora engagement policies, those of India and of Ethiopia, the paper questions the success of government mechanisms, establishing the conditions under which these mechanisms lead to political and economic benefit from the diaspora. The paper argues that government resources and capacities to design and implement policies and the composition of migrant communities play a key role in determining the approach governments adopt with their diasporas. By Dr. Katherine Kuschminder and Dr. Metka Hercog. ‘District creation in Ghana: A political expedience or poverty alleviation mechanism?’ assesses the poverty reduction basis of district’s creation in Ghana. The article presents the creation of districts as a convenience political exercise and a trapping mechanism which maintains a poverty status quo rather than alleviation. By PhD fellows Victor Osei Kwadwo and Emmanuel Mensah. ‘Migration and the education of children who stay behind in Moldova and Georgia’ investigates the school performance of children in migrant and non-migrant households by giving a unique focus on school performance as measured by caregivers and children themselves. The article shows that living transnationally does not necessarily relate with poorer school performance. Different transnational characteristics nuance the effect of migration on children’s education. Caregivers may assess child education differently but not necessarily in a negative way. The findings highlight the importance of considering different transnational characteristics and who makes the assessment. By Dr. Victor Cebotari, Prof. Melissa Siegel and Prof. Valentina Mazzucato. ‘Internet infrastructure and regional convergence: Evidence from Turkey’ presents novel evidence regarding the role of regional internet infrastructure in reducing regional per capita income disparities. The authors base their study on the assumptions that (1) the diffusion of information homogenises regional economies through reducing the dissimilarities in institutions and culture, and (2) the telecommunication capacity, represented by the internet infrastructure of a region, facilitates this flow of information. Using the data from the 26 statistical NUTS-2 regions of Turkey for the period 1999–2011, they find evidence that internet infrastructure increases the speed of regional convergence. By Dr. Mehmet Guney Celbis et al. ‘The interaction between social protection and agriculture: A review of evidence’ analyses the empirical evidence on how social protection impacts agricultural production and how agricultural interventions reduce risks and vulnerability at the household and local economy levels. Most studies show that social protection can increase agricultural production while agricultural interventions can lower vulnerability. However, the availability of evidence is uneven across outcomes and developing regions. This article concludes that existing evidence largely provides an empirical rationale for building synergies between social protection and smallholder agriculture. By. Dr. Nyasha Tirivayi et al. ‘Labor Market Reforms in Europe: Towards More Flexicure Labor Markets?’ provides an overview of reform patterns and tries to assess whether and to what extent these reforms have led to more or less dualised labor markets in terms of dismissal protection, the provision of unemployment benefits and access to ALMPs. In particular, the article provides some evidence on potential changes in hirings on temporary contracts. By PhD fellow Caroline Wehner et al. ‘Migrants in countries in crisis: Supporting an evidence-based approach for effective and cooperative state action’ is a regional discussion paper as an annex to the background paper on the Migrants in Countries in Crisis initiative dated February 2015 (”MICIC Background Paper”). The MICIC Background Paper presents the history, purpose, scope, and background of the initiative, while this regional annex provides background that is especially relevant to the East and Southern Africa regions. The MICIC initiative seeks to improve responses to all non-nationals/non-citizens present in the country experiencing a conflict or natural disaster. The MICIC initiative is developing practical guidelines that complement existing refugee protection frameworks. This document provided the basis for discussion at the Regional Consultation for East and Southern Africa, on 3-4 May 2016 in Kigali, Rwanda. By Dr. Katherine Kuschminder and Research assistant Sarah Langley. ‘The Role of Culture and the Arts in the Integration of Refugees and Migrants’ explores and elaborates on the ways in which arts and culture can support the integration of migrants and refugees through a mapping of examples from across Europe. Owing to the limited number of evaluations it is difficult to make concrete statements regarding whether some forms of art are more likely to facilitate the integration of refugee/migrants. The preliminary mapping has however allowed an initial examination of the ways in which different types of arts could be applied to promote different aspects of integration. In general, the report finds a positive relationship exists between cultural activities and different dimensions of integration. Also see the short summary report ‘The Role of Culture and the Arts in the Integration of Refugees and Migrants: Member State Questionnaires’ By Researcher Elaine McGregor and PhD fellow Nora Jasmin Ragab. ‘Social Cash Transfers as Economic Investments: Contextualising the Transmission Channels between Uganda’s Senior Citizens Grant and Economic Growth.’ This policy brief summarises the evidence base on the potential pathways from social pensions to economic growth and calls for a more differentiated approach that takes account of the structural circumstances in which livelihoods exist. This shifts the focus from the targeted individual to the functioning of social pensions within the wider structural contexts that determine its effect on economic growth. This approach can make vital contributions to a better coordinated policy system that reaches beyond the recipients of SCTs. By PhD fellow Maria Klara Kuss and Paddy Llewellin. ‘The CDM framework: knowledge recombination from an evolutionary viewpoint‘ was presented at the 16th International Schumpeter Society Conference, in Montreal, Canada, 6-8 July 2016. Based on the groundbreaking econometric framework published in 1998 by Crepon, Duguet, and Mairesse (CDM), this study is an exploration of the spread and recombination of ‘knowledge’ in the CDM ‘universe’: i.e., all papers in Scopus indexed journals citing CDM or/and CDM cited papers. The authors assess first the speed and range of diffusion of CDM and investigate next the ‘origins’ and further ‘genealogical’ makeup of the knowledge recombination within the CDM universe. During the course of the study and analysis they found that an increasing number of papers cite CDM, while these papers themselves are spread over an increasing number of field, or disciplines. BY Profs. Jacques Mairesse & Bart Verspagen, and PhD fellow Ad Notten.